CASE continues to charge ahead! President Laurie VanderPloeg also recognized the individual CASE award recipients. Dr. Stevan Kukic received the Outstanding Service to CASE award for all his support and involvement with CASE over the years. Kathy Fortino (Michigan) was selected Outstanding Administrator of the Year for her amazing work in Michigan and her contributions on CASE committees. Wyllys VanDerwerker (VA) was this year's recipient of the Harrie Selznick award — the highest award given to a CASE member. CASE Night was a wonderful evening even though the Phillies lost 6-2 to the Brewers! Go to the CASE Facebook page to see pictures from the both the CASE Annual meeting and the CASE Night event. If you haven't "LIKED" CASE yet, please do so! Have you checked out the new CASE Career Center? CASE now has an interactive job board, the CASE Career Center. With its focus special education administrators and professionals, the CASE Career Center offers members, and school districts, a highly targeted resource for online recruitment. Both members and non-members can use the CASE Career Center to reach qualified candidates. Employers can post jobs online, search for qualified candidates based on specific job criteria, and create an online resume agent to email qualified candidates daily. They also benefit from online reporting providing job activity statistics to track each job posting's return on investment. Don't forget — the CALL FOR PROPOSALS for the 25th Annual Fall CASE Conference is now on the CASE website &madsh; click here for more information and to submit your proposal on line. The drop dead date for submission is April 27 so don't let it slip up on you! Every year we have people contact us a week after the deadline and we are not able to accommodate them. The conference will be in San Antonio this year Nov. 13-15 at the Hyatt Regency. This will also be the 25th anniversary of the CASE Fall Conference so we are looking to make it a stellar experience. To do that we need lots of great, evidence based, practical sessions! It's Not Too Early to be making plans to attend the 12th Annual CASE Educational Legislative Leadership Summit (ELLS), July 13-16! Today is the last day for the EARLY BIRD registration at pre 2014 prices on the CASE website click here to go to registration and click here for the flyer. This year as every year, is a very important time for CASE to have as many different states represented up on the Hill for our visit on Tuesday, July 15. There are several really important national issues we will be working on in DC this year with our other association partners. Don't miss this great opportunity. And, with a hotel group rate of $149 at the Hilton Old Town, right across from the King Street Metro stop, this might be a great time to do a DC excursion for you and the family! Group rate ends June 17 so click here to make your hotel reservations! The Kids In Need Foundation, a national, nonprofit organization dedicated to providing free school supplies to economically disadvantaged school children and under-funded teachers, is launching its fourth annual teacher grants program sponsored by Elmer's Products Inc., an industry leader in adhesives, arts and crafts, office and educational products. Beginning Feb. 14, teachers nationwide can visit the Kids In Need Foundation website to apply for an Elmer's Teacher Tool Kit grant that can range from $100 to $500. The CEC Policy Team has been humming Elton John's Philadelphia Freedomall week long here in preparation for the CEC Annual Convention & Expo, which kicks off today! With over 800 professional development sessions on anything and everything special/gifted education, there's much to do between now and Saturday, April 12. This year at CEC's 2014 Convention & Expo in Philadelphia the Legislative Action Center, located in CEC Central, will feature a fun and effective way of driving the voice of special educators, administrators, students and more with our Special Education/Gifted Funding Twitter Campaign. Advances in educational technology make it possible for educators to tailor their instruction for students with special needs. The debate over the Common Core State Standards overlooks the broad problems inherent in the core curriculum that has been taught in schools for decades. Marion Brady explains. Brady has worked as a teacher, administrator, college professor, contributor to academic journals, textbook and professional book author, consultant to publishers and foundations, newspaper columnist. Can schools be held accountable without standardized tests? The focus on scoring well on standardized tests has wedged educators into a difficult spot. Teachers are concerned that a poor showing on the tests will jeopardize school funding, or even their jobs, and often feel they have to suspend everything else in order to focus on test prep. Putting so much energy into one assessment — one that doesn't give teachers and students any granular, actionable information — takes resources, time, and energy away from other kinds of rich learning experiences. The American educational system has a difficult time understanding dyslexia and an even harder time identifying children with dyslexia in order to provide the correct intervention for students who are native English speakers. When a school has the added challenge of identifying struggling English language learners, the task becomes an even more complicated process, and often, these kids are completely missed. But that does not have to be the case. Children who are learning English are just as likely to have dyslexia as their native-English-speaking counterparts, and there is a way to identify dyslexia in these children. The difference is that dyslexia might appear in the native language quite as vividly as it will when they attempt to learn English. A bill aimed at improving student literacy skills, and especially helping those with dyslexia, received final passage Wednesday from the Iowa Senate. Senate File 2319, which was sent to Gov. Terry Branstad, will place a definition of dyslexia in the Iowa Code for the first time, said Sen. Brian Schoenjahn, D-Arllington, who was the bill's floor manager. Dyslexia is a reading disability due to a defect in the brain's processing of graphic symbols. Decades of increased taxpayer spending per student in U.S. public schools has not improved student or school outcomes from that education, and a new study finds that throwing money at the system is simply not tied to academic improvements. The study from the CATO Institute shows that American student performance has remained poor, and has actually declined in mathematics and verbal skills, despite per-student spending tripling nationwide over the same 40-year period. Advances in educational technology make it possible for educators to tailor their instruction for students with special needs. 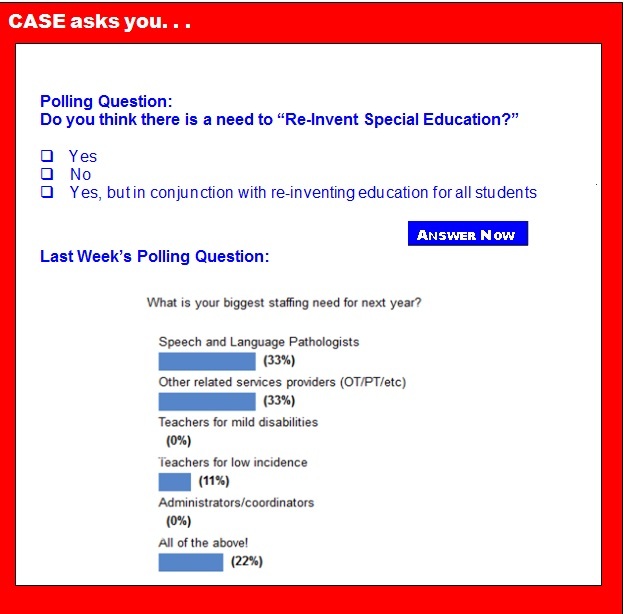 These technologies, including online speech therapy and platforms to align goals in a student's Individual Education Plan with Common Core objectives, make it easier for teachers to spend more one-on-one time with students who have special needs or require additional classroom accommodations. Jessica Lahey, a contributor for The Atlantic, writes: "'I hate the Common Core,' the mother of two complained when I told her I write about education. 'What, specifically, do you hate?' I asked. 'The math. It makes no sense! I can't help my kid with his homework and I don't understand the new methods at all.' What I told this mother, and what I wish I could explain to every parent frustrated with the nonsensical math homework coming home in our children's backpacks, is this: The confusing math methodology everyone is complaining about is not part of the Common Core State Standards." Now that spring is finally here, kids cooped up during this particularly brutal winter might be looking forward to enjoying some sunshine. Many will have to control the wiggles a little longer, though. It's standardized testing season, which means silent hallways, desks arranged in rows, and for many kids, a lot of anxiety until it's over. Now that the tests in many states are getting harder in order to align with the new Common Core standards and being used to grade teachers, not just students, they're also producing a lot of anxiety among parents and teachers, too. In response to the added pressure this year, a movement against standardized testing is gathering steam as some parents decide to let their children opt out of the tests.